Run and guns are very unique competition formats, and they require unique gear setups. Run and gun shooting competitions are highly addictive, unique 2 gun shooting competitions. 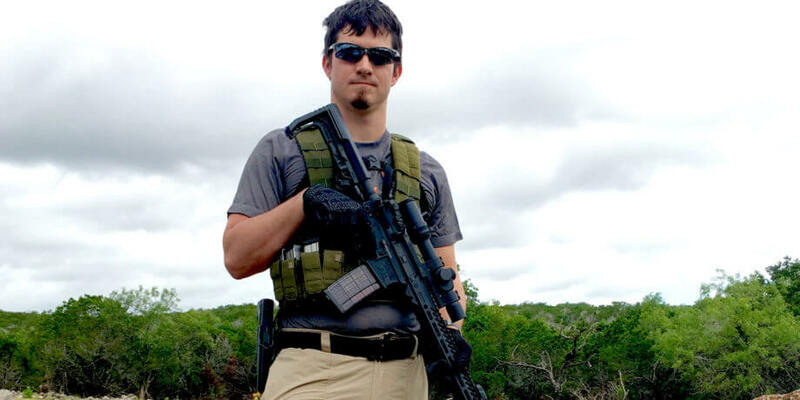 Run and guns generally involve a rifle and a pistol, about five miles of running/walking, carrying everything with you, and shooting multiple stages along the way. Every run and gun has their own unique flair to them and they will push your physical, mental, and shooting skills to their limits. Some run and guns include obstacles, some run and guns require you to use guns provided at the stage, some run and guns even happen at night! 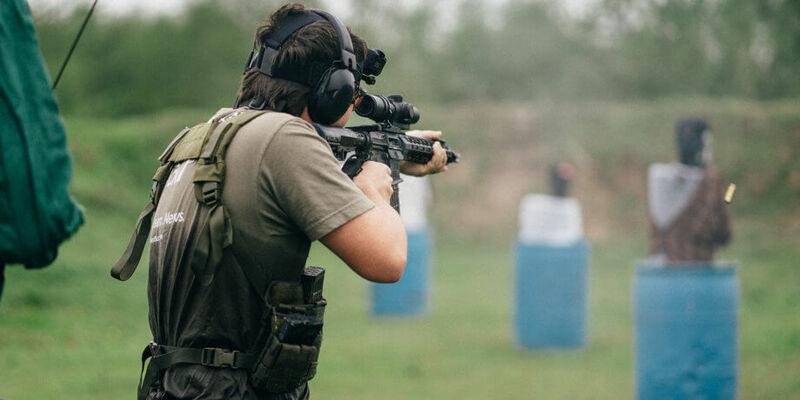 Since run and gun shooting competition formats are so unique, one of the most common questions surrounding these events is, “what gear do I need for a run and gun?” So let’s take a look at exactly what gear is needed for a run and gun and how people will set things up. The key with your run and gun gear setup is to keep it as lean as possible, for both weight and bulk. Every run and gun gear setup is unique. While there is no one true perfect gear setup as every person and event is unique, there definitely are some wrong ways to set up gear for a run and gun. Since everyone has their own body sizes, firearms, and various preferences, please don’t take this video as the one and only way to set up your run and gun gear. Use it as a general guideline to pick what gear meets your needs, body type, event, and budget. Just like how every run and gun gear setup is unique, every run and gun competition is unique and subsequently can require unique gear. Reach out to the match director and (if you can) individuals who have run the event before. Ask them about the unique aspects of their events and what gear is recommended. Most Run and Gun event pages list out required gear, recommended gear, hit counts, and the like. The community similarly tends to be very open and friendly – as a general rule everyone is very happy to talk about guns and gear. The important and time critical gear needs to be accessible at all times, particularly magazines. But at the same time, all gear must remain secure enough that it doesn’t get lost during the running and shooting stages. Some run and gun competitions even have obstacles that need to be climbed over, crawled under, or waded through. Your run and gun gear needs to stay secure or else it will be lost along the way. At the same time, your important and time critical gear needs to be easily accessible. For example, if you’re shooting a stage that requires both rifle and pistol, you can’t afford to be taking the time to fish around for a rifle or magazine that is secured inside your backpack. Also, you can’t properly or safely wield your pistol if you have to carry your rifle in your hand because you don’t have a rifle sling. When selecting your run and gun gear, be very mindful of how secure each and every item is so you don’t lose it along the way. Also orient your gear, particularly your firearm magazines, so they are easily accessible during the stage. Fishing around inside a backpack kills stage times. Did I mention that magazines need to be easily accessible? Well, they should. Chest carrier or battle belt setup? Both chest carriers and battle belts have their own pros and cons for run and guns. Selecting one or the other is quite the debate amongst the run and gun community. Chest carriers distribute the weight very well, but battle belts can be a lower profile and a little lighter. Personally, I go for a hybrid setup, utilizing a little bit of both. I like having the solid weight distribution of a chest carrier, and having some padding between myself and my rifle or the ground. The key to a good chest carrier is to have it as low profile as possible. Some chest carriers stack magazines upon magazines which can get in the way for obstacles. I keep some magazines, generally one rifle and one pistol, on my belt as that means a faster reload. Then between shooting stages I swap out magazines so I always have a full magazine on my belt for easy access. I’ll even load rounds between partial magazines so I always have full ones. It’s always bad to load a 1/3 full magazine into your rifle at the beginning of a shooting stage. Active or passive retention handgun holster? The answer is simple – whichever holds your handgun securely without it falling out. Active retention holsters, such as the Safariland ALS design, are great for doing that. However, they can be expensive and they are not compatible with all handguns out there. 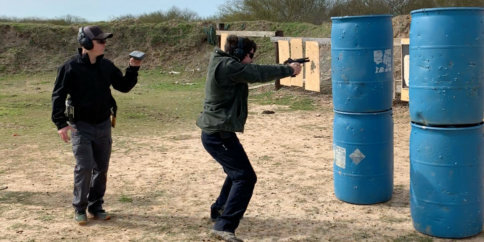 A passive retention design can be more than enough to hold down a gun, even for the demands of a run and gun, if it is a quality material and tightened down securely enough. To test this, take your holster, turn it upside down, and give it a shake. If the handgun falls out, the handgun isn’t secure enough. Tighten down the holster if it has that feature or go buy a new holster if it does not have that feature. Personally, I use a holster from Dara Holsters, Red Hill Tactical, or GW Kydex depending on the event and the handgun. However, I strongly recommend against trigger finger activated retention holsters such as the Blackhawk SERPA holster. They are quite unsafe and that design has resulted in a number of people getting extra holes in their body. Many of these run and gun shooting competitions are in rather remote places. Your physical well being is very important, more important than your placement on or off the podium, especially when help may be far away. Carrying plenty of water, particularly during the heat, is critical. Dehydration and overheating is very serious. Not only could it be a very serious health risk, being physically drained like that will impact your shooting performance. Similarly, a trauma kit, even if it is a basic one, is a good idea to have. What would be a fatal gunshot wound can be successfully plugged up with the right tools. Speaking of tools, some sort of multi-tool and ramrod are great things to have for a run and gun. If your firearm has a serious malfunction, you can’t go back to the car to fix it. I’ve seen people have to end a run and gun early because they had an issue with their gun that they couldn’t fix in the field. Whatever gear you get for a run and gun, test it! There is lots of great gear for run and guns out there, but just because an individual piece of gear is good, doesn’t mean it is good gear for run and guns, your body type, or even your gear combination. I’ve seen normal, good pieces of gear conflict with each other in odd ways. A med pack sticking out in a weird way and interfering with a magazine reload for example. Sometimes gear has to be cinched down properly in order to work well, otherwise, it will bounce around and bruise the person wearing it. So be sure to test your run and gun gear as you would use it in a run and gun competition. That’s the only true way to catch gear conflicts or other issues before the event, not during.